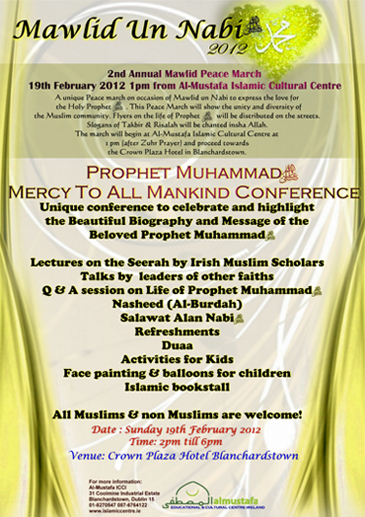 In order to highlight the true personality and message of the Prophet of Islam, we have organized a unique Conference on the 19th February in Crown Plaza Hotel Blanchardstown from 2pm till 6pm. Irish Muslim scholars, leaders of other faiths, politicians will be present insha Allah and speak on many topics relating to the life of the Holy Prophet (SAW). Academics and non Muslims will be invited specially and Free Islamic literature will be distributed. We would like to invite everyone first of all with their families to this conference and then request you to invite your colleagues and non Muslim friends to this event. At the end there will be a Question and Answers session (which will be very important as this gives the audience an opportunity to engage in the discussion) There will be activities for kids also separately organized insha Allah.